Throughout our 70-year history, our programs and services have contributed towards building a more inclusive and accessible society. This involves enabling the people we support to make decisions that empower them in their everyday lives. Patricia Kasongo is a single mother of two children with autism, who has faced many obstacles. A month after her husband passed away from bowel cancer, her son Nathan (then 3) was diagnosed autism. “I didn’t know anything about autism or what to do. I certainly did not have any strategies to make his or my life easier. The only place where he would eat his meals would be in his high chair, which had to be placed in the centre of his bedroom, watching Dora the Explorer while I fed him. It’s crazy to think how far we’ve come.” Nathan and Nyota’s mum – Patricia. With no family living in Melbourne, Patricia started seeking support from a parents group of other children with autism, and a local carers group. Soon after, she started working with a key support worker from Scope. 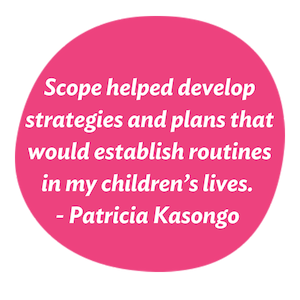 “Scope helped develop strategies and plans that would establish routine in my children’s lives. Before I used to think that if I took Nathan and Nyota to all different types of therapists, that would be enough to help them, Scope helped me realise that was not the case. As their mother, the person who is around them 24 hours a day, I have to be the one leading and implementing these changes. Scope helped a lot with building up my confidence to believe in myself ,” said Patricia. Nathan, now seven, attends prep at Western Autistic School. He is now verbally communicating and eats independently with the family at mealtimes. Four-year-old Nyota goes to childcare four days a week, and has begun to settle in and enjoy her time there. For Patricia, her children’s diagnosis has opened up a world of opportunity for her. While being the primary carer of her two children, Patricia has earned a Diploma in Early Childhood Education and is planning on working with other children with autism. The work we do is only possible thanks to generous supporters like yourself. The knowledge and experience we have gained over the past 70 years has enabled us to guide and assist families at every stage of life. This children’s week, lets pledge to help more people like Patricia.